Well, I’ve become fascinated. 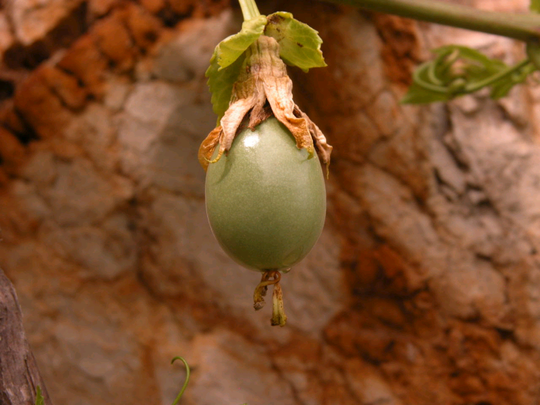 I wrote earlier about my passionflowers (granadilla) which bloomed unexpectedly. Now, the two plants have exploded, outgrowing the puny 6ft by 6ft trellis I had erected and still going strong. Strong, shiny bright green leaves just cover the wall – apparently fragile but amazingly tough growing tips that seek out new spots to populate (in 3D – I think they are trying to reach across the garden into my bedroom window!!) – spindly but strong tendrils that spiral round anything available within reach and the beautiful passion flowers. But it is a little disappointing to discover flowers that drop off without being fertilised. Why do the flowers last only a day? What can possibly be the evolutionary advantage to restricting the fertile period to little more than 24 hours? I would have thought that the longer the flowers are open and receptive, the more fecund the plant. Hmmmh. And the fruit – forms nice kiwi-sized green fruit that will eventually turn purple. But when? They seem to be taking ages (None of the fruit than has formed since early January has changed appearance from the admittedly smart shiny green hard fruit) . It’s not that I’m impatient, but just curious about how such behaviour can sustain a species. Any ideas?